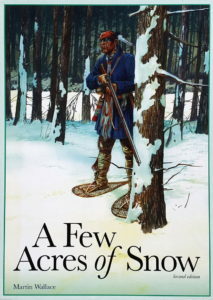 A Few Acres of Snow is deck building, war game for two players by Martin Wallace, published in 2011 by Treefrog Games. 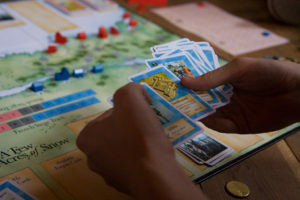 Two players take on the roles of commanding the French and British armies during the French and Indian War. 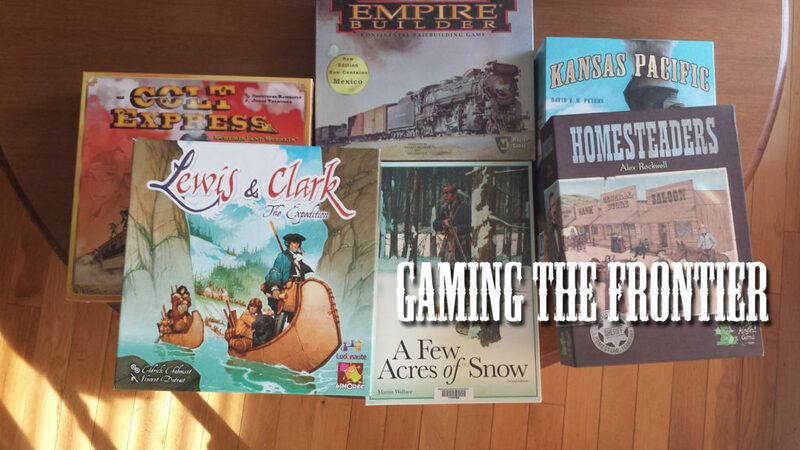 This is the third interview in my Gaming the Frontier series. I am honored to have English game designer, Martin Wallace, tell about designing A Few Acres of Snow. Matt Saunders (MS) – Could you please introduce yourself? Who are you and what do you do when you aren’t designing board games? Martin Wallace (MW) I’m a middle-aged full-time board game designer presently residing in New Zealand. I have been actively designing board games since 1992. Since then I have had over seventy titles published. When I’m not actively working on design I’m usually asleep or in the shower. I try to keep fit with a little tennis and cycling. I enjoy tramping through the hills when I get the opporunity. (MS) What is the story behind designing A Few Acres of Snow? (MW) The inspiration for A Few Acres of Snow came about after a conversation in a pub. I used to regularly meet once a week with a few friends down at the local pub. One of these friends. John Ellis, is a historian with a number of published books to his name. At that point in time he had been doing some reading on the French-Indian wars and was struck by how much of the fighting was regulated by rivers. He thought that this might be the basis for a game. I did a little bit of reading and then decided to give it a go. (MW) It seemed to me that the closest parallel with the French-Indian Wars was conflict in space. I had played many sci-fi games in my youth, such as Imperium (Marc W Miller). Movement in these games was generally point-to-point, as in going from one star to another. Armies in the French Indian Wars rarely cut across land, so generally moved between already existing locations by water, either sea or river. It also occurred to me that there was an element of ‘Star Wars’ in the theme, as when one side brought to bear their ‘Death Star’ in the form or artillery then the combat was pretty much over with. You also have the situation that the combatants are a long way from home and so getting reinforcements takes a long time. (MW) I would love to be able to give you a list of the books that I read but for the life of me I cannot remember them. I would normally just look on the book shelf and see which titles I used, but at the moment we are moving around NZ and all of my books are in storage. The only book I can remember is Clash of Empires published by Osprey. (MS) Would you say your game attempts to capture more of a “realistic” or “romantic” sense of the American Frontier? Why? (MW) When I take on a historical theme I aim to reflect a few essential elements without loading in too much detail. The main elements I wish to capture were the point-to-point movement and the problems of planning. You could plan to carry out a campaign but if the necessary supplies and troops did not turn up on time then your campaign would end before it started. I would not say that I was aiming for an overly realistic feel, but just to give the impression of fighting a war a long way from home. (MW) The key mechanic that made everything fit into place was deck-building. I had only recently played Dominion for the first time. I was not blown away by the game but the deck-building mechanism was interesting. This was the perfect mechanic for the game, as it elegantly simulated the time-lag between asking for something and receiving it. You could ask London for more ships but when the turned up was another matter. It also allowed me to simulate the problems of planning – you need the right cards in your hand to carry out specific actions. Cards are a very powerful tool in the game designer kit as they can be used to perform a range of functions. I like to make cards multi-use, giving you the headache of deciding whether to use a card for combat or movement. (MS) Thinking about the integration of theme and mechanisms, how does your game portray Native Americans (Indians) and the relationship they had with Europeans? (MW) As you know, games are abstractions, so cannot always deal with the nuances of reality. In general I wanted to show that the French engaged more with the Native Americans and benefitted from alliances with more tribes than the British. The game does not show why this is the case, just reflects the general situation. As this is a wargame the use of Native Americans is military, essentially raiding. (MW) I tried to portray the Native Americans according to the research I had carried out. I knew from films such as Last of the Mohicans that the Native Americans played an important role in the wars. As stated above, it was only really possible to show their role in raiding. I also showed that certain tracks could only be used by Indians – such as Kennebec. (MW) I’ve not really stopped to compare my treatment with other forms of entertainment. Within the context of a board game Native Americans are another ‘resource’ to be used to further your aims. I know that in games on the American Civil War where Native Americans are represented it tends to be as unreliable skirmishers – which may or may not be accurate. I would like to think that within A Few Acres of Snow that the Native Americans are shown to be neutral, in the sense they will co operate with either side depending on circumstances. In films they have to be portrayed as good or bad, depending on whether they are fighting for the British or French. (MS) What type of experience do you want players to have from playing A Few Acres of Snow? Is there anything specific about life on the American Frontier that you wish for players to experience? (MW) I’m a strong believer in the notion that a game should first and foremost be fun to play, then if its an accurate simulation then that’s a bonus. I would like to think that A Few Acres of Snow is an engaging design because it gives you a wealth of different options without loading you down with lots of rules. Once again, cards are a good mechanic as they usually dictate what your options are at any single point in time, rather than having an overwhelming number of actions to choose from. Games can be educational, but not necessarily in a direct manner. Just playing over a map familiarizes people with geography and locations. The game stresses the importance of transport links and how difficult it is to move your armies around. It also reflects the asymmetry between the French and the British, with the former more interested in making money from furs while the latter is focused more on actual colonization. I think the game could be used in a high-school setting to encourage some discussion about features of the war. I think it is interesting that one of the main criticisms of the game is that there is a particularly strong British strategy (known as the ‘Halifax Hammer). What people forget is that a game allows you to refight the same battle or war as many times as you wish until you reach what you think is the best strategy. In the real-world you only get to fight once. Over a number of years the British eventually realized that there best strategy was heading for Quebec – which is the same strategy as the Halifax Hammer. In the end the French really did not stand a chance as they were heavily outnumbered. It took years for the British to realize this advantage. (MW) I would like to add one more comment about the game which may be of interest, which is the historical nature of maps. At the time that North America was being colonized by the British and French there were very few maps available. It was only when the first accurate map was produced in the mid 1700s (I do not have an exact date as the book in question is in storage) that the British could see that the French were in danger of surrounding them by connecting the Quebec with New Orleans. Until then the place was too large to have a picture of what was going on. Once it was known what the French were up to then steps were taken (Braddock’s campaign) to try to stop this. I just find it interesting that we now take a global view for granted, but actually it is a very recent thing. I am incredibly grateful to Martin Wallace for taking the time to share his story about designing A Few Acres of Snow. 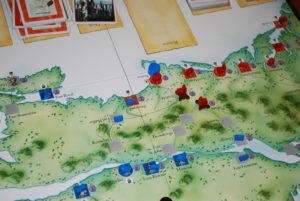 For more information about the game, please visit the game’s entry at BoardGameGeek.com.